South Africa has a rich poker scene and online poker is alive and more than well. Maybe you didn’t know, but poker pros like Raymond Rahme and other recognized players around the world actually come from South Africa. And get this, the second annual World Series of Poker (WSOP) was hosted in South Africa. South Africans can easily join internationally regulated and recognized online poker sites without a problem. With Texas Hold’em poker on the rise, an increasing number of South Africans get into online poker as a hobby or for an alternative source of income. The trend doesn’t seem to be slowing down. In fact more and more online poker sites appear that welcome South Africans and offer the ability to deposit and wager in their native currency. As technology develops each year accessing online poker sites on mobile devices, gets easier for South Africans especially those players belonging to the middle-class or lower. Which Government Agency Regulates Online Poker in South Africa? Can I use South African Rands to play poker online? What payment methods can South African poker players use? Are there players online at South African peak hours? Can I use my mobile to play online poker? Can I play poker at real-money sites for free? South Africa has a long history of gambling restrictions. That history started changing several years ago when the legislators showed interested in changing the laws gradually in order to keep up with the industry and the needs of the citizens. However, things are not that simple. It’s the trademark of South Africans to make things complicated and confusing, and so are the laws pertaining to online poker and online gambling. With the 2004 National Gambling Act all online gambling activities were banned. However, in 2008 the government decided to relax a bit. It realized that South Africans play at online casinos or poker sites anyway despite the ban, so it decided to cash in on it. That year the National Gambling Amendment Act was introduced with the intention to raise the ban on the online gambling market. However, some of the biggest land-based operators in South Africa started meddling and lobbying for the government to keep it banned. They hid behind anti-fraud protective agencies under the pretext that they are concerned about the wellbeing of South Africans. In reality they were concerned about drops in their profit due to players going online, so online gambling was kept illegal. The ban was further hardened in 2010 when it was lobbied that international casino sites should be banned too. If you try to find facts from various resources, you will get different information about whether online poker is legal. But, according to information provided by the government which can be found at the website of the justice department, you will notice that online poker is illegal in South Africa if those websites operate from the country. So, how come South Africans play at South African online poker sites? Well, the laws have been created in a way to scare off South African poker operators, and not the actual players. So, South Africans continue to play online poker for real money at international poker sites without facing repercussions. Plus, the government did a bad job in outlining whether poker falls under the National Gambling Act that regulated online gambling. But a glimmer of hope appeared in 2017. Now, again changes are considered which may lift the ban for online gambling in general. The agency responsible for oversight of the regulation in the gambling industry throughout South Africa is the National Gambling Board. According to the board, its aim is to preserve the integrity of the citizens as responsible. If you fall victim to a fraud or corruption, you can report it to the Board. The National Gambling Board is also the agency where you have to go if you want to receive a gambling license to operate a land-based operation in South Africa. Now that we have clarified somewhat the legality of online poker in South Africa, in the following you will find answers to the five most frequently asked questions about South African poker sites. 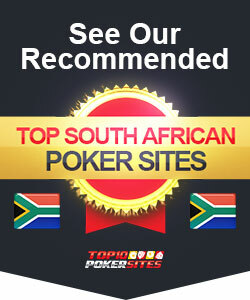 We don’t say “South African poker sites” for nothing. They are not really South African because they operate overseas, but they implement all sorts of features to make South African poker players feel comfortable and welcomed. So, giving players the option to make deposits, withdrawals and wagers in Rands is one of those features. Just like poker players from other countries in the world, South Africans can use the same payment methods as them such as credit and debit cards, wire transfer, or more convenient methods like Skrill, Neteller and PayPal among the many. All of these are industry-standard methods and you will find them at 90% of the poker sites. Since online poker sites operate globally, expect to find enough poker players to play against during daytime or nighttime in South Africa. People from all over the world gather to play poker online, and many of them are within the same time zone as South Africans. Even if they aren’t, there are always passionate poker players that play during off hours. Yes. If you register with those sites that are riding on the cutting edge of gaming technology, you will be able to play poker on your mobile through native or web-based apps. If you are new to poker and don’t want to spend money immediately, but desperately want to try how it is to play at a real-money poker sites, you may want to look for freeroll tournaments. These are tournaments in which you can participate without paying an entrance fee. The best thing is that if you finish in the top spots you can get your share of the prize pool without spending a single Rand.